The images captured are expected to have a tremendous impact throughout the world and be listed as "the most important UFO/extraterrestrial images ever filmed in all of the world." 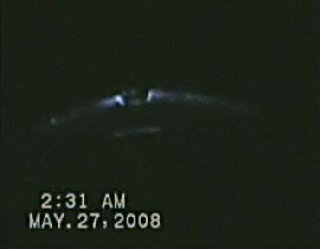 During the 4 months between May and September 2008, many nationwide UFO sightings were reported from different parts of Turkey, while some of them were filmed and photographed and aired. Within the same period of time, these objects also witnessed by the residents of Kumburgaz/Yeni Kent Compound, caught on video several times by a night guard named Yalcin Yalman, and this footage is considered as the closest and the most significant images ever filmed around the world. In this amazing UFO video footage which will likely have major repercussions around the world and be listed as “the most significant UFO videos ever,” physical forms of UFOs and their metallic structures are clearly noticeable. What’s more important is that in the close-up of some of the footage of the objects, entities in them can be distinctly made out. İstanbul / Kumburgaz UFO's and ALIENS ARE BACK in 2008! from fox mulder on Vimeo. We came to a point that leading scientific research centers around the world have been setting up research centers on Ufology, furthermore, high-ranking retired military and government officials, astronauts, congressmen, scientists, senior military commanders, colonels, generals, jet fighter and civilian pilots, radar operators, top intelligence officers of CIA and FBI, department of defense officials have been releasing documents they possess regarding UFOs and openly revealing facts to the public. Now it’s time for world governments to disclose the “UFO Reality.” Such a disclosure is critically important for all humanity, and it would certainly be a turning point for the history of our planet. The disclosure of extraterrestrial life would also launch an unprecedented era, unify humanity by the awareness of earthling beings ensuring peace, harmony and unity consciousness and lead our dear planet to a new age of intercommunication and wisdom. The recent harsh cycle our planet has been going through marks the period in which ecological, social, energy, and health problems worsen day by day. We believe that deteriorating circumstances make it vital for our government officials take a step to reveal the truth about UFOs.